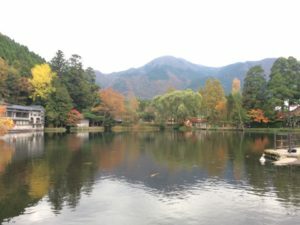 After completion of Fukuoka Marathon, I spent a week in Kyushu visiting Fukuoka, Yufuin, Nagasaki, Kumamoto, Aso and Kurokawa. What a fantastic runcation. People are friendly, foods are super yummy, and the mountains and onsens are just amazing. I seriously think every race should end with an onsen trip! However, completion of Fukuoka Marathon means beginning of my Returning to Ultra! At the end of 2016, I was on a running roll. Completed Kobe Marathon, Fujisan Marathon, and North Face Endurance Challenge 50K on back-to-back weekends, despite had to travel cross huge body of water :-p. And I had no plan to slow down during the holidays, instead the plan was to cruise into my ultra training and prepared for Tarawera 62K, MUC 50 Mile and Zion 100K in April. But that fatal fall at Yosemite cost me big time, all the training plans and big goal got shattered and derailed. Now, I am ready to come back! It’s very clear that my fitness level in endurance, stamina and speed is no where near where I was before, and the challenge of starting all over is going to be so hard that I need structured help! Lucky that my coach Dennis is able to help me before his Team Asha season begins, so I will have his time & mentor-ship from now till April. Saturday Nov 25th, coming back from Asia I was sick and jet-lagged, but I figured exercise would help with fighting both. 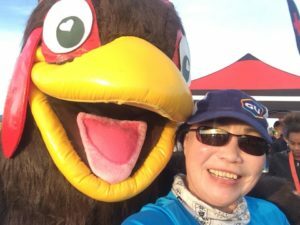 Plus I missed the Silicon Valley Turkey Trot, therefore I went to Brazen Quarry Turkey run and it’s so nice to see Marcia and Michael volunteering at this event. I miss them a lot while I was sidelined. I was shocked that 13.1 miles was harder than running a full marathon while my legs literally felt like they were filled with lead. My head was spinning from jet-lag and I had to chug down two cokes after crossing the finish line, which I rarely drink. After receiving the finisher medal, I had to nap in my car for 20 mins before driving home. I was THAT tired. Saturday Dec. 9th, It has been an year since I broke my foot at Yosemite, and I haven’t run trail race ever since. 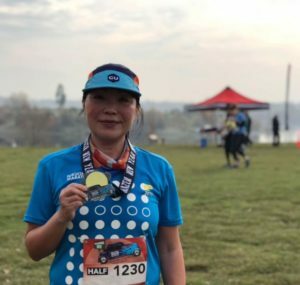 The last 4 months I was focusing on getting ready for my first coming-back road marathon. Now I need to know where I am at, and the best way to do this would be through a trail race. Right? And better yet pick a hard one! 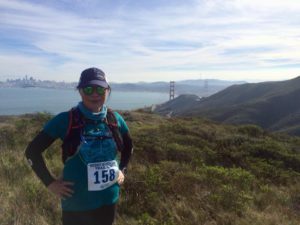 PCTR Rodeo Beach Trail Run was just perfect for the purpose, and I have missed running at Marin Headlands so much. Comically I was overexcited about running my first trail race again, and quick fingers clicked “50K”. LOL. Thank goodness that the kind RD Greg let me downgrade to the 30K distance, and I toed the start line at Rodeo Beach on a perfect day for running! I started at the back of the pack, and as expected I was slow and out of breath. But that didn’t take away the thrill and joy I experienced here, and not once had I complained or questioned my decision to torture myself :-p. This challenging course offered vistas of the Pacific Coast, and I was completely taken away by the spectacular Marin Headlands with amazing views of San Francisco, Tiburon, the Golden Gate Bridge and coastline flickering under California winter sunshine. Yes I was slow, and had to walk all the uphills, and I was so scared that I may trip and fall again at every downhills. Honestly I was frustrated with myself of how slow I had become, or how frightened I was of technical terrains. But nevertheless I was so grateful that I am back! Coming back is going to be HARD! Sunday Dec. 17th, I haven’t run Christmas Relay for several years, back when I was a road runner it was an annual ritual to run around the lake in holiday jingles and stocking. 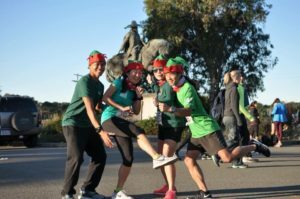 This year, to mix fun run with hard training I went with my dear friends for this festive holiday relay at Lake Merced. Since Kiyoko, Vinh and I were just back from our Asia trip, we called our team “Tired Legs Runners.” I proposed that we cooked breakfast at the parking lot, and they forever perfect Project Manager Michael took up the lead. We brought propane stoves, eggs, bacon, OJ, coffee, toast, pastry and more pastry.. and joy & excitement. The less than 5- mile loop around the lake was nothing extraordinary, but the friendship and holiday spirit was awesome. My teammates made up my slow pace, and everyone had a great time standing and eating hearty breakfast cooked by Michael. You go Michele! you got this you badass! Look forward to reading about your adventures.